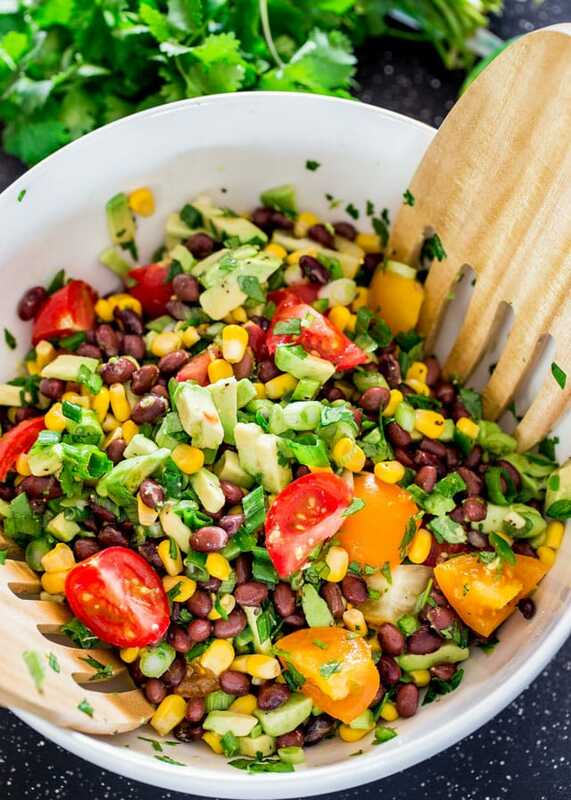 This Black Bean, Corn and Avocado Salad is a crowd pleaser, colorful and full of nutrition. 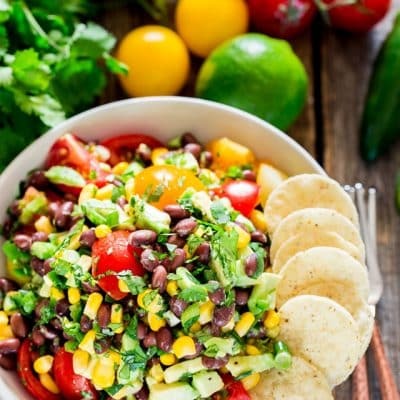 This salad is great served as an entree, side or even a delicious salsa. Have you ever tried to eat low carb? Let me tell you it’s not my thing. Though I have to admit that every once in a while I get the low carb bug and try and give up carbs for a couple weeks at most. I’ve never been successful of doing it for more than two weeks, I love bread too much. Heck, I love all carbs too much. However, whenever I go through the low carb zone, this is one of the salads I always turn to, which is a favorite of mine. I know it still has carbs, I never said carb free, and when I do go low carb, for me that usually means giving up bread for the most part. This salad though is full of nutrition. I actually posted this salad 5 years ago, believe it or not, and thought it was time to give you guys some better pictures. 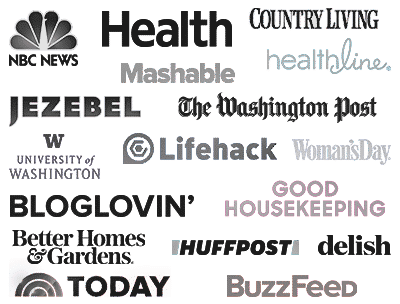 I originally found the recipe in a book I’ve had for a long time called Make It In Minutes, and when I first tried it, I was pleasantly surprised because I had another great salad to add to my repertoire. My favorite thing about this salad is that it has no oil, can you believe it? I almost always add olive oil to my salads, but this right here doesn’t require it. The dressing is simply lime juice and I seasoned it a bit with salt and pepper. Trust me it’s full of flavor from all the wonderful ingredients here. 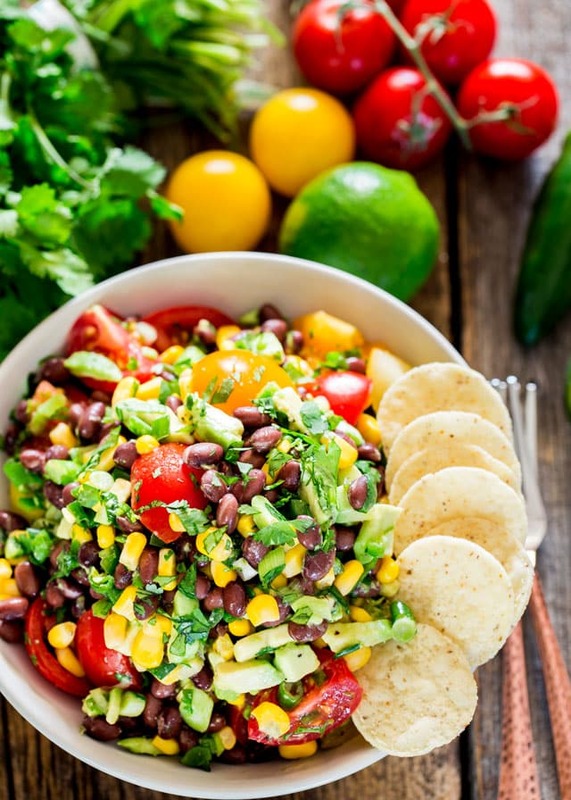 But the beauty of this salad is that it can be served as a meal on its own, a side dish or even as a salsa, though if you serve it as a salsa I’d chop the tomatoes a bit smaller. I actually made this salad today because we bought a smoker, and we smoked a whole lot of meat, salmon, pork, chicken, you name it, so I needed a salad to go with all that meat. However, if you serve it as meal and aren’t too worried about the carbs, then go ahead and serve it with some tortilla chips. It’s yummy! Do you love this salad? Try these! 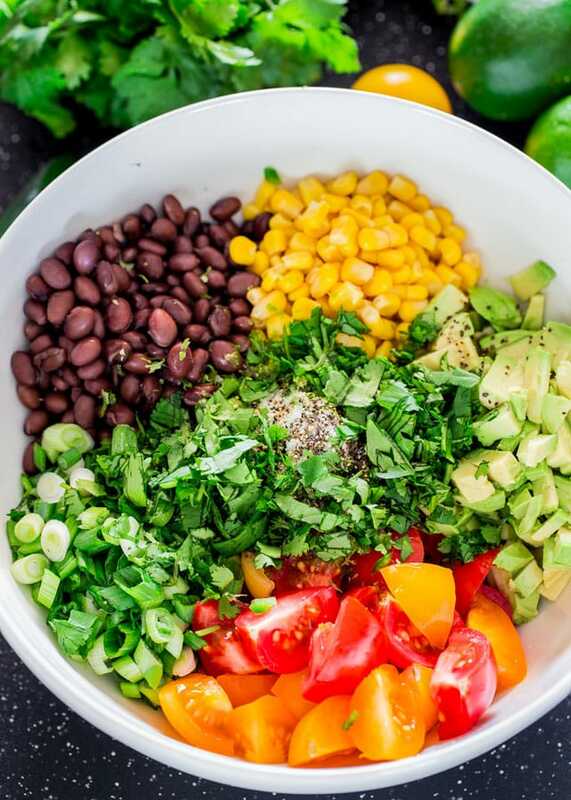 To a large bowl add the black beans, corn kernels, chopped tomatoes, avocado, jalapeno pepper, cilantro and green onions. Zest one lime and add the zest to the bowl, then squeeze the lime juice from 2 limes, should be about 4 tbsp or so, then season with salt and pepper. Toss everything well together. This salad can also be used as a dip. You can refrigerate this salad in an airtight container for up to a day. Wow, great salad! Prepared for a soup and supper gathering last night, and it was a hit. Several request for recipe. For the first time, I prepared just as written, and it was so good! Every one of your recipes I have tried have been excellent. Thank you. Glad to ‘meet’ you Jo!!!! Nice one! Glad to meet you too, Penelope and glad you liked the recipe! This looks too fresh and too delicious. Perfect tasty (and pretty healthy!) addition to the Sunday football spread! I’m on a veggie and salad kick right now, and this salad looks delicious. I must say, though, that at first I thought I saw a fried egg in the salad (I’m crazy about eggs, too!) Taking a closer look, I assume that what I saw was a yellow tomato. ? Love salads so will definitely try this one! Thanks for the inspiration! This is a very good salad. I also add chopped cucumber, and use a red onion instead of green onions..I also add the avocado when I serve it so the salad can store for longer than one day in the fridge. Any kind of bell pepper adds flavor. Salt, pepper and a dash of balsamic vinegar top it off. Lost 20 lbs. eating this salad……well, I also walked my legs off too! YUM! 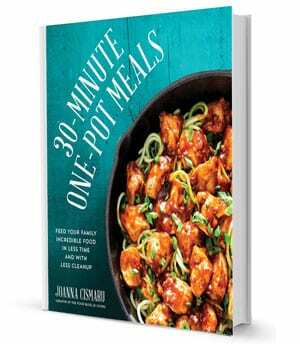 I just made a big batch of this and it is delicious! I did add a some minced onion, Adobo seasoning, and lime juice. Thanks for posting! do you know how long this lasts in the fridge?? If I were to make a batch for my boyfriend and I for the week would it stay well for multiple lunches?? Sounds delicious and easy! Hmm, never made this to last for a few days, I would imagine the avocado would get brown, so you could try it and just not add the avocado until that day.